Our shower filter reviews are based on personal experience, degree of filtration, water industry certifications, and customer reviews. The same criteria goes for our bath filters. 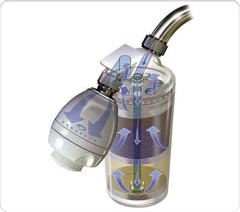 Click here to see our bath water filter reviews and recommendations. 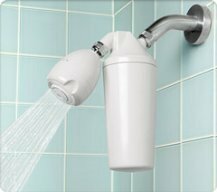 If you are showering in tap water, one of the main reasons to consider a shower or bath filter is because of the health risks associated with daily exposure to chlorine and chlorine by-products. Numerous scientific studies have shown that the problem is not so much the chlorine in water, but rather the disinfection by-products, called DBPs. You can learn more about the health risks associated with daily exposure to chlorine in tap water while bathing and showering here. A good quality shower (and/or bath) filter can significantly reduce these health risks for people of all ages. In fact, children and the elderly are at highest risk for health issues. I recommend the following filters (in no particular order) because of their filtration media, company reputation and reliability, customer reviews, personal experience, and overall value. The first shower filter I purchased many years ago was an economical Sprite filter that I found at the local home improvement store. It served my family well and provided a noticeable reduction of chlorine – at least to a certain degree. 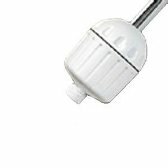 The ones I am listing in these shower filter reviews are the shower-head type because that is what I prefer. However, if you like the hand-held type, all of these companies provide that option with the same level of filtration. In addition, most shower filters come in a variety of finishes, including white, chrome, satin, or brass. The following shower filter reviews are a few steps up in quality from the ones you will most likely find in a department store. However, when it comes to shower filters, any degree of filtration is better than none! Aquasana’s filter system is certified to remove 91% of chlorine from your shower water - for a healthier shower, softer skin, and shinier hair. Ninety-one percent reduction of chlorine is a high percentage considering the high flow rate of water used during a shower. Many shower filters only achieve about 50% reduction. This shower filter also reduces chlorine by-products (THMs) as well as volatile organic chemicals (VOCs) by greater than 90%, as well as significant amounts of lead and copper. What I like best about this Aquasana shower filter is that its unique two-stage process uses a combination of copper-zinc oxidation media and coconut shell carbon. This filter combination not only reduces the chlorine in your water, but it also reduces synthetic chemicals and enhances pH balance. This filter is easy to install and the filter cartridges last 6 months or 10,000 gallons. Aquasana offers a 90-day satisfaction guarantee and a 1-year warranty. As with all Aquasana products, you get high-quality performance and great value for the price: $85 retail. Read more about the Aquasana shower system and get a 20% discount. Sprite Industries offers a number of shower filters, but I like this specific one for a number of reasons, mainly because it uses a combination of Kinetic Degradation Fluxion (KDF) and Chlorgon media for filtration. KDF filters are effective for reducing chlorine, iron hydrogen sulfide, lead, mercury, chromium, and other dissolved metals. The media may also inhibit the growth of bacteria, algae and fungi, commonly found in bathtubs and showers. A substance called Chlorgon is also included in the KDF media of this filter, which increases the temperature range for effective chlorine removal. In fact, it is NSF certified to reduce both free and combined chlorine. (Note: the company does not specify the percentage of chlorine reduction). One of the things I like best about this Sprite model is that it delivers a strong, high-output stream of water and has a strong housing with a guaranteed longer life than the average shower filter. The HOC filter cartridge does not need to be replaced for an entire year. The cartridge is also reversible, so you have the option of reversing the filter to ensure maximum usage and water filtration. The filter comes in chrome or white finish and has a 1-year warranty. It provides high value for just $36. Click here to purchase and to check out the Amazon.com shower filter reviews. This Culligan shower filter is certified to remove up to 99 percent of chlorine, as well as other impurities in the water. In addition, it reduces sulfur and scale (that hard, filmy residue in municipal water), which provides more hydrating nourishment to skin and hair. This showerhead provides filtration for up to 10,000 gallons of water, or about six months, and it meets NSF standards for water safety. One of the things I like best about this filter is the fact that it filters such a high degree of chlorine and chemicals. But I also like its anti-clog rubber spray nozzle (with five spray settings) and nice chrome finish. 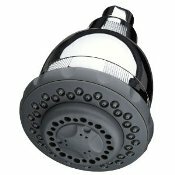 This showerhead is easy to install within minutes and does not require any tools. Culligan offers a limited five-year warranty. Please think seriously about the value of minimizing your family’s exposure to chlorine and its by-products! If you only had $50 to $100 a year to spend on your health and prevention, I can’t think of a better way to invest that money than by getting a shower filter(s) in your home. You will get far more bang for your buck than you would get from investing the same amount in vitamins or other health supplements! Chlorine in Tap Water - Why Use a Bath and Shower Filter?